It's been a long road for Toy fans looking to get a Peter Capaldi for their desk. We had the tiny figure that looked bad both in publicity stills and in hand - but now it looks like we might just have a shot at a decent Twelfth Doctor figure, in the form of this 1:6 toy from Big Chief Studios. 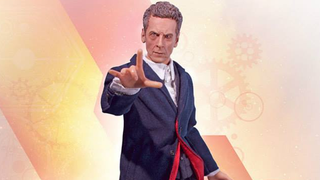 Peter Capaldi&apos;s 12th Doctor figure is... not really Peter Capaldi? It's the shrunken TARDIS! It's in scale to its appearance in Flatline, but even better is that you can either place an insert of The Doctor's face into it, like he's peering out from the inside, or use an included peg to attach one of the spare hands that comes with the toy, to recreate The Doctor's 'Thing' moment where he crawls the tiny TARDIS out of the way of an oncoming train. That's a pretty awesome bonus right there. Big Chief's 1:6 12th Doctor will be out sometime next year, and will set you back £170 (or $220 to US customers because of no VAT charges). If you're interested, you can preorder it from Big Chief's website here.